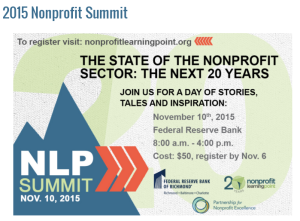 The Nonprofit Learning Point Summit held at the Federal Reserve Bank of Richmond on November 10, 2015 happened weeks ago, however, what I gained from the experience of attending it resonates even today. I catch myself thinking about the theme of that day–stories, tales, inspiration– and what the impact of the stories shared by the presenters had on me. Stories about personal and professional growth, collective struggle, and the ageless passion of the nonprofit sector to continue the uphill and often arduous effort to improve lives, systems, and services in our community. Executive directors, vice presidents and CEOs stood before us unafraid to share their journey about what brought them to where they are now. It was touching and insightful to listen to them talk about their youth with all its vulnerabilities and the people or the one incident that was life-changing for them: either the adult who made them standup and take account of their present in order to make way for a brighter future, or the caring stranger who was at the right place at the right time to lend a helping hand, or the first time they heard hip hop music that spoke to their heart in a way that only truth in poetry can. I was motivated by the lessons the speakers wanted to impart upon us. Strive to become the Master Encourager; by doing so you will elevate people to do more because they can. Become the person you needed as a kid, because that is what changes lives, one child at a time. While sitting among the participants, I couldn’t help but wonder—individuals have a lifetime to measure the impact of an experience, and they can evaluate that impact by self-assessment and the changes they recognize in themselves and what surrounds them. For nonprofit organizations, however, measuring impact can be quite different. How can nonprofit leaders of today and the next 20 years evaluate their organization’s effort(s)? How can they measure the impact of their leadership or programs and services on those they serve? 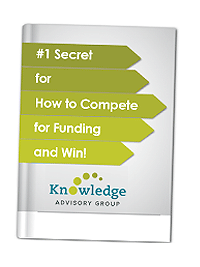 It seems to me proving the success of their efforts and the changes made through evaluation and measurement is one of the most vital stories nonprofits need to tell…to their constituents, donors, and future stakeholders. Knowing the impact made in measured terms and being able to share it with others through story-telling–whether it be in an annual report, grant proposal, needs assessment, or professional conference—would not only be meaningful and sustainable; it would be unforgettable. All members in the nonprofit sector could benefit from developing a storytelling point of view by keeping in mind the meaningfulness of the impact of their efforts in measurable terms.